It’s about fun, it’s about maps, it’s about sport in natural surroundings. if you enjoy fresh air and exercise, if you like map reading, if you want to take part in a fascinating, challenging sport in the outdoors, then orienteering is for you! If you’re a walker, a runner, a family: orienteering can give you a life-long interest and take you to places you didn’t know existed. Almost all orienteering events will have a range of courses for people of different ages and abilities: short and easy for beginners and children, longer and more challenging for improvers, longer and with more difficult navigation for experts. The history of orienteering begins in the late 19th century in Sweden, the actual term “orientering” (the original Swedish name for orienteering) was first used in 1886 and meant the crossing of unknown land with the aid of a map and a compass. In Sweden, orienteering grew from military training in land navigation into a competitive sport for military officers, then for civilians. The name is derived from a word root meaning to find the direction or location. The first orienteering competition open to the public was held in Norway in 1897. From the beginning, locations selected for orienteering have been chosen in part for their beauty, natural or man made. For the first public orienteering competition in Sweden, in 1901, control points included two historic churches, Spånga kyrka and Bromma kyrka (a round church). With the invention of inexpensive yet reliable compasses, the sport gained popularity during the 1930s. By 1934, over a quarter million Swedes were participants, and orienteering had spread to Finland, Switzerland, the Soviet Union, and Hungary. Following World War II, orienteering spread throughout Europe and to Asia, North America and Oceania. In Sweden in 1959, an international orienteering conference was held. Representatives from 12 countries (Austria, Bulgaria, Czechoslovakia, Denmark, Finland, East and West Germany, Hungary, Norway, Sweden, Switzerland, Yugoslavia) participated. In 1961, orienteering organizations representing 10 European nations founded the International Orienteering Federation (IOF). Since then, IOF has supported the founding of many national orienteering federations. By 2010, 71 national orienteering federations were member societies of the International Orienteering Federation. These federations enabled the development of national and world championships. World championships were held every two years until 2003, then every year. Ireland first took part in the World Championships in Scotland in 1976. Typically, orienteering is run in wild terrain. In its Scandinavian origins, this typically meant in the forest, but orienteering in open fell, heathland, moorland and other mixed terrain is also common. Orienteering in towns has been common for many years. The Venice and London street-O events are notable for attracting a large international participation. With Park World Tour races and other (e.g. World championships) elite sprint races often being held in urban areas, and the development of a map specification for urban areas (ISSOM), from the mid-2000s, Street-O has been rebranded as urban orienteering, and has taken itself rather more seriously, with full colour maps and electronic punching, and may now be regarded as a serious competition with inclusion in national ranking lists. Such urban races are often much longer than the sprint distance. 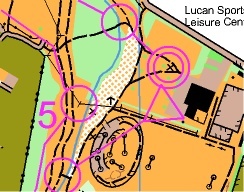 3ROC, founded in 1976, is a full member of the Irish Orienteering Association.